One of the latest datasets we have published is the National Small Business Survey done by Financial Sector Deepening Uganda in 2015. This dataset holds responses from 1,839 face-to-face interviews with micro, small and medium enterprises in Uganda on their nature (ownership, legal status, sector etc.) and scope (sales, employee numbers, years of operation, access to finance etc.). Drawn from Uganda Bureau of Statistics' census of business establishments, this sample is nationally representative. You are welcome to download it and explore. Our own quick dive into the dataset played up some really interesting insights on the landscape of micro, small and medium enterprises in Uganda. 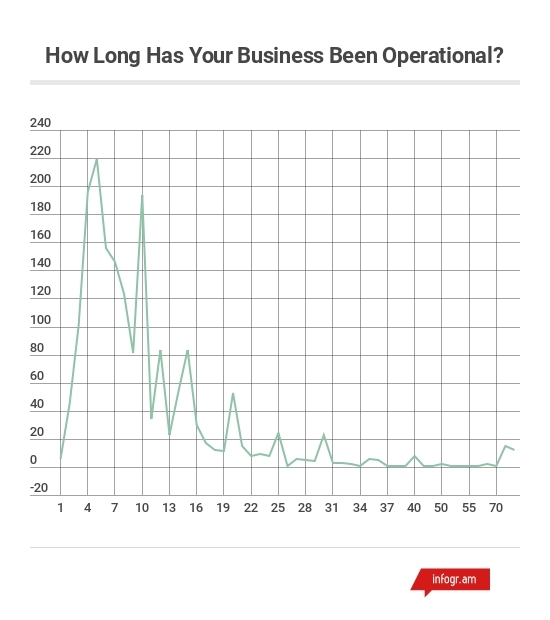 For instance, the vast majority of these businesses are less than 10 years old. Nearly three quarters of small business in Uganda are owned by a single individual, as to other modes of ownership like partnerships, limited companies, cooperatives and so on. Interestingly, 55% of these owners, would take a full time salaried job, if it was offered.